Tip the Wink Design create websites which help people find information quickly and easily. Careful planning is essential, not only as to how the web pages look but how viewers work their way around the whole website. Once the ‘navigation’ has been agreed, the page layouts can be sorted choosing colours, fonts, images, text and emphasis. All this is achieved by listening carefully and offering suggestions, which may help promote visitors to your website. The framework for a site can be created, which can then be populated your text / images. You, the client, plus any others with permission, can thereafter make changes to the content or add more pages. Once you are happy with the updates, these are saved and instantly published on your website. There is no need for any special software, just a computer with a connection to the internet plus a few IT skills. Once the website has been built to your brief, training is provided to help you manage your own content. If you have any further queries, just get in touch with Gay. If you wish to sell products, services or digital downloads via your website, then Tip the Wink Design will discuss the various options, so it can be decided which would suit best your immediate and future needs. Whether a straightforward PayPal link or a more complex ‘browse and add to shopping basket’ approach, it will include the ability to manage orders, offer secure methods of payment and appropriate delivery systems. Once your website is launched you will want others to find it easily. Most people use the search engines such as Google, Yahoo or Bing to locate a relevant websites or information. To put your website high on their lists, methods can be used to aid this. It is known as ‘Search Engine Optimisation’ or SEO. Let’s be clear, there is no direct way to ensure your website will be the top of any ‘search’ list but it can be helped. From building a website, which is fully compliant to the recognized W3C standard, the choice of words on the web page and even the number of links from other sites made to your website. Even having the right page titles and providing an accurate, relevant description of your website does make a difference. 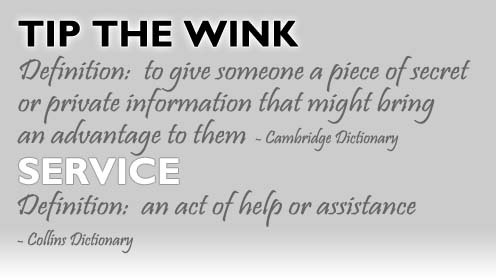 Tip the Wink Design can advise and assist in this very important aspect of promoting your website. To track how successful your website is, there is a widely used marketing resource, provided by Google, which can be simply added to the coding. where in the UK / World? what they typed into the search box to find your site? what pages they were particularly interested in? if there were particular peaks in visitor numbers? This information can then be used to focus the content accordingly. In order to launch your website on to the World Wide Web, it will need to be hosted on a server. Many companies offer this and prices and packages vary greatly. The choice is yours, however, Tip the Wink Design can also provide this service. No hidden extras, that is a promise! Please contact Gay for further details. Even though there are many providers of email (for example: gmail. Yahoo, etc), you may want one with your own dedicated address. One, or several, which are connected with your website or business (for example: info@... / sales@...). Tip the Wink Design can set these up as and when required. Carefully organized, visual information, can convey a more effective message or idea. Whether a poster, brochure, form, logo or website – the design should emphasize the message, to present data or get a desired response. Several aspects need to be considered such as the target audience, where and how it will be displayed and what is the key message. Tip the Wink Design, with over 20 years experience, knows how to use a variety of techniques to achieve results, based on an understanding of colour, typography, illustration, photography, layout etc. everything it does and owns. Design is part of that mix.